The Scratching Post – 2014 Issue No. 2 – Tails High, Inc. Please enjoy this edition of the Tails High newsletter. We can always use help creating more content so please email Beth if you can volunteer to write an article. We would really like to hear stories about your foster kitties or your adopted Tails High cats. Tails High will participate in this year’s Spring2ACTion fundraiser campaign on April 9, 2014. We will have 24 hours to raise as much money as we can online from our supporters, volunteers and all their friends and family. The 2013 campaign yielded Tails High approximately $6000 with very little planning. This year we have more time for outreach and community engagement. So mark your calendar and be ready to jump online and spread the word to raise money for our kitties. Mark your calendars for June 21st, for a fun night at the Hilton in Old Town Alexandria from 6PM – 10PM. The Tails High Purr-Raiser will feature a silent auction, raffle as well as great stories and updates on our adopted kitties. The restaurant and bar will be open for beverages and good food. If you would like to donate an item for the silent auction, please contact Kristi. Who Are You Calling A Feral Cat? This term is very often misunderstood, misrepresented, and misused. Many people think a feral cat is one who lives outside without a human family but there’s much more to it than just that. Please help us clear up this misconception and help people understand what’s what about cats called feral but who really are not. Let’s start with a simple definition: A feral cat, is a cat that is not socialized with humans. While feral cats are socialized to their colony members (meaning their fellow cats) and may be bonded to each other, they do not have that same relationship with people. The following diagram gives a visual look at the various kinds of free roaming cats and below the diagram we have provided additional details on the differences between strays and ferals. Stray: A stray cat is a cat who has been socialized to people at some point in her life, but has left or lost her domestic home, as well as most human contact and dependence. Over time, a stray cat can become feral as her contact with humans dwindles. Under the right circumstances, however, a stray cat can also become a pet cat once again. Stray cats that are re-introduced to a home after living outdoors may require a period of time to re-acclimate; they may be frightened and wary after spending time outside away from people. Feral: A feral cat is a cat who has either never had any contact with humans or whose contact with humans has diminished over time. This cat is fearful of people, will do what it can to evade or escape human contact and survives on its own outdoors. A feral cat is not likely to ever become a lap cat or enjoy living indoors. Kittens born to feral cats can be socialized at an early age and adopted into homes as pets. If you have encountered a cat and are trying to determine if the cat is feral or a stray, consult the advice in the Alley Cat Allies article to help you make that determination. Above all, do everything possible to avoid being injured. The Trap-Neuter-Return philosophy takes into account each cat’s level of socialization to determine the best environment for them. Socialized cats and kittens can be adopted into homes. On the other hand, feral cats must be returned to their outdoor home after being trapped and spayed or neutered. If you wish to learn more on the differences between stray and feral cats visit the Alley Cat Allies Website. Q. Should I feed my cat wet food or dry food? A. If you were to ask this question to 5 different veterinarians you would probably get 5 different answers. Tails High recommends feeding your cat wet food exclusively. Below we have weighed the pros and cons of each. Cats are carnivores by nature so you should always make sure that your food’s first ingredient is a meat such as turkey, chicken, venison, beef, not a byproduct, a plant, or a grain. Cats are different than dogs in this aspect as they lack specific metabolic pathways and cannot use plant proteins as efficiently as animal proteins. Taurine is an amino acid found in animal proteins and a deficiency of this nutrient in your cat’s diet can cause blindness and heart problems. Also interesting to note is that cats have a very low thirst drive. They need to consume about 70 percent water in their diet. Canned food averages 78 percent, and dry food averages 10 percent. Cats on dry food diets usually don’t get enough water and may become chronically dehydrated which contributes to health problems like Chronic Renal Failure (CRF) and urinary crystals that can cause blockage. This is one of the main reasons that many vets recommend wet food. Another reason is that wet food tends to be lower in carbohydrates than its dry food counterpart. Too many carbs can lead to obesity and/or diabetes in cats so foods with less carbohydrates while still providing the necessary protein and other nutrients is a better choice. It is sometimes thought that dry food is better for your kitty’s dental health but regular dental brushing and cleaning is important regardless of the food your cats eat. Many vets will advise against the habit of leaving dry food available all day though. Think about what humans would look like if we let ourselves snack all day! Dry food does tends to have more calories than wet food, so while dry food may be effective for an undernourished cat who needs to gain weight there’s a risk that a normal, healthy cat could become overweight as a result. It’s because of all this that Tails High sticks with our recommendation to provide canned/wet food as your kitty’s primary food source. But in the end, it is your personal choice what to feed your cat. Be sure your cat gets enough water and animal nutrients in their diet and only gets the carbohydrates they need. If you choose to switch your cat’s diet, always do so slowly while mixing both the old and new foods to avoid any digestion problems during the transition. For more information on the nutritional composition of various cat foods, see the incredibly informative charts at Catinfo.org. You’ll also find a lot of good information about cat nutrition and foods at Little Big Cat. Do you have an opinion or a personal experience on wet vs dry food? Let us know, either post your comments to our Facebook page or send us an email with your story. We will feature the best stories in next month’s newsletter! Do you want to stay in the know about new Tails High cats available for adoption? We can also tag you in our Facebook posts so you get a Facebook notification when our photos are posted. If you’d like to sign up for that, just send us a message on Facebook and we will take care of it. Echo and Bikini speak out! We are Coco (formerly Echo) and Critter (formerly Bikini) and we founda new family about 2 months ago. We have settled into our new home in Northwest DC wonderfully and have very quickly endeared ourselves to our doting humans. We’ve spent considerable time exploring our new digs and have developed “fun routines” that our humans think are predictable but we’ve fooled them because we’re really the ones in control. Our fun routines include generous amounts of laser pointer tag, bedspread pouncing games, stair climbing/acrobatics, and bird watching. We’ve also been introduced into the cult of Redskins football by preparing for the 2014 season through pillow, blanket, and merchandise “marking” (that means we leave our fur and scent all over those things). Hail to the kitties! Coco – I’m demure and coy, with a wonderfully transparent affect to my character which crumbles immediately with a few strategic strokes of the brush to my all brown coat or presentation of my most-beloved string toy. Critter – I’m the extrovert; the playful one; the puppy; the teenage mutant ninja mama’s boy- the first one to closely inspect what’s being served for dinner (for the humans), and the first one to scurry into a lap of safety when a “stranger” comes by the house to visit. Our kitties LOVE the Cat Catcher toys. They can’t get enough of hunting that little mouse and carrying it away with them. You can buy them through our friends at Creme de la Cat here. Tails High, Inc. is a 501(c)(3) tax exempt public charity so your donation is tax deductible and we will send you a receipt by mail. Email us at meow@tailshigh.org if you want to learn about taking the next step. Share your favorite cat video. Send it to us at meow@Tailshigh.org. Please consider donating enough money each month to cover the cost of one of our expenses. 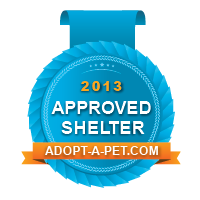 When you shop online by entering sites through adoptashelter.com, you earn money for Tails High. After eight very successful years, Creme de la Cat has closed their doors. They have supported Tails High since our inception in 2009 and we’re very sad to see them go. Best wishes to Ernie, Terry, and her husband in their retirement. Now you can make a generous gift certificate donation to Tails High simply by clicking through the banner provided below.